Headliners, start getting your costumes ready! Escape: Psycho Circus is returning to haunt your Halloween season at the NOS Events Center in San Bernardino, CA. Come join the dark side and unleash your inner freak at the world’s finest Halloween festival as we celebrate the seventh installment of Escape. Enter the realm of the Psycho Circus, where dance music’s most wicked artists take over our unique and enhanced stage designs, as intricately dressed ghouls and goblins and interactive art installations rattle all your senses. 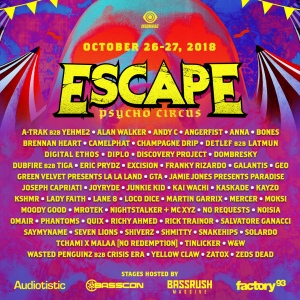 For more info, visit the Escape Website!